New Zealand’s Kaikoura Canyon—known for its abundant seabed life—is now an undersea wasteland following a series of earthquake-induced mudslides. Back in November 2016, New Zealand was rocked by a series of strong earthquakes. These quakes triggered a number of landslides, some of which spilled mud and debris into the ocean. 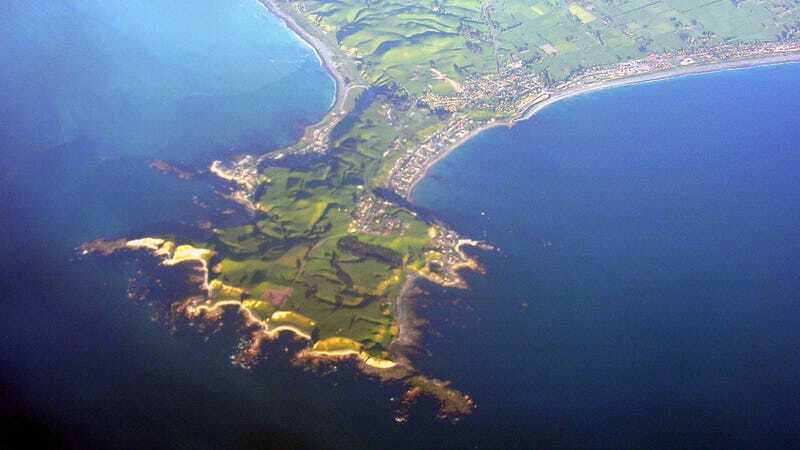 Scientists have now learned that Kaikoura Canyon was hit by a particularly large series of undersea mudslides, destroying everything that lived on the seafloor. Kaikoura Canyon is a u-shaped underwater trench that stretches for 40 miles (60 km) in the northeast region of New Zealand’s South Island. Ten years ago, a joint mission by researchers from New Zealand and the United States found that the mud on the canyon floor is absolutely packed with sea critters, leading to its designation as a marine reserve. The floor of this canyon is home to a very dense population of large invertebrates, such as burrowing sea cucumbers, spoon worms, bristle worms, and sea urchins. All this life contributes to the surrounding ecosystem, not to mention the local commercial fisheries. November’s earthquakes sent piles of mud and debris into the central channel, snuffing out everything in their path. “In 2013 everything at the head of the canyon was smooth and draped in mud,” noted NIWA marine geologist Joshu Mountjoy. “Our new data shows that the earthquake resulted in a huge slipping event. Almost every part of the upper slope had mud removed from it.” Mountjoy said the amount of mud that slipped into the canyon was “massive.” The structure of the canyon remains intact, but the mudslides left no evidence of seabed life, according to the results of two surveys conducted earlier this year. “We surveyed exactly the same area we did in 2006... this time didn’t record evidence of a single organism living on or in the seabed over a stretch of nearly six kilometres [4 miles] of seabed. Nothing. It was quite sobering, and a catastrophic event for the ecology of the canyon.” Previously, the seafloor was covered with burrows, tracks, pits, and mounds made by seabed animals—but now it’s smooth and barren. While investigating the site, the researchers spotted some fish and whales, but it’s not known how the loss of seafloor marine life will affect these predatory populations. Encouragingly, the researchers have every reason to believe that the area will eventually bounce back. And in fact, given New Zealand’s seismic history, this has probably happened before. Indeed, the mud may have wiped out the seabed’s organisms, but the conditions for life remain intact. The very means of destruction—the mud itself—may eventually provide the habitat required for these ecologically important lifeforms to return. Is New Zealand On the Brink of Another Major Quake?